The impulses for development work come from our customers. Fitesa is one of the world's largest nonwovens suppliers to customers who use the material for their products primarily in the field of hygiene. Fitesa has 11 factories in the world, one of which is located in Norrköping. In cooperation with Gothia Logistics, we have developed web-based employee orientation training comprised of a final test of 10 random multiple-choice questions that must be correctly answered before a personal course certificate is allowed to be printed directly. This introductory course aims to provide answers to various questions and to assist in the work of Fitesa Sweden. Our work on obtaining material for the course has internally contributed to improved insights into the necessity of explicit routines and communication. Introductory training started at early April 2018, focusing primarily on vacation substitutes for the coming summer. Gothia Logistics has decided to strategically ally with CIPM (Suzhou) in China with intent to strengthen our access to the China’s market. We hope that the integration of Gothia Logistics’s expertise on manufacturing and logistics and CIPM’s valuable market resources will lead to increased business for both parties and better value to our clients. In the summer of 2017, in cooperation with Gothia Logistics, we have adapted existing courses on food safety in the field of organic food and the problem of allergens in food. The task of distribution for the municipality of Linköping commences on November 1, 2017 and will last for 5 years. Coordinated distribution of goods is something that is increasing in many areas of the country and is a segment that fits well into GDL's operations. The education begins at week 42 and includes the courses Warehouse Management of Food for Co-distribution and Safe Food Transportation. In the spring of 2017 we, in collaboration with Gothia Logistics, have developed a new e-course Safe Food Transportation in Swedish and English for our approximately 100 drivers who are responsible for transporting food. We have used the Gothia Logistics customized systems by removing and adding course materials. Since our drivers are of different nationalities and transport food in Europe, e-learning method is crucial to inform and ensure that the training is carried out in an approved manner. This is undoubtedly a flexible way for drivers to acquire knowledge at their convenience. The course Safe Food Transportation focuses on quality and security during transportation according to the claims set by the EU and the National Food Agency. The participants must take the course and pass their final exams. Afterwards the participants can print out a certificate that can be presented to a supervisory authority. We get direct reports on the performance of the drivers and can therefore provide our customers the necessary certificates. Even this year Gothia Logistics carries out 2-3 training programs in the field of TPM for Production School at Volvo with the courses Basic TPM and Operator Maintenance . The program is combined with both E-learning study with guidance and test and seminars, practical exercises and improvement projects on the spot. The participants consist of prospective production leaders from the Swedish plants in Torslanda, Olofström och Skövde. 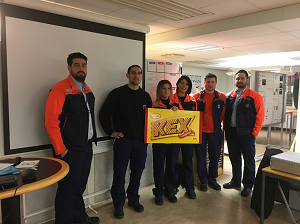 At week 10 this year, the winner of the improvement project TPM Competition at Production School in Skövde, Team Metall were voted by other groups. The prize was a huge bar of Cloetta kex chocolate from Östergötland. 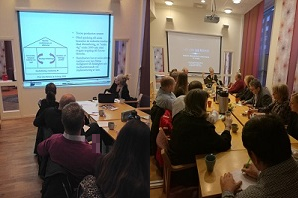 The last and well-attended meeting organized by Gothia Logistics network took place on the 25th of November this year. The theme is "The consequences of Lean Production on working environment and health". The researcher on working environment Anna-Carin Fagerlind Ståhl has written the report on this theme published on the Swedish Work Environment Authority. On the 22th of April, Gothia Logistics network had its meeting at Rusta's new central warehouse in Norrköping with the theme of regionally technique-equipped central warehouse for retail logistics. After the presentation and discussion on Rusta's concept of effective Scandinavian logistics, a tour was led by Andreas Havenslätt and Emma Lang from Rusta. A few pictures of the tour are showed here. Gothia Logistics carries out 2-3 new training programs at the school of production at Volvo Car Corporation even this year. The courses are: Basic TPM and Operator Maintenance . The project includes E-learning plus guidance and tests, seminars and practical trainings at the site. The participants are composed of would-be production leaders and production technicians from the Swedish factories in Torslanda,Olofström and Skövde and one in Ghent, Belgium. In 2015 we had a successful cooperation with Gothia Logistics on the e-course " Operational Purchasing – Overview", for the B.Sc programme Logistics and Management of Jönköping University . In cooperation with Gothia Logistics we continue in 2016 to develop a new e-course on " Supplier Planning and Delivery Monitoring" for our 80 students. We make use of Gothia Logistics’s customized system by removing and adding course materials as we wish in our new course. As our students are located world wide, the e-learning method is crucial for this course and it is undoubtedly a flexible way for the students to study theory and understand hands-on cases. We do hope that the course developed with Gothia Logistics will motivate our students to work with Purchasing, Logistics and Supply Chain in the future. PostNord Logistics TPL is the leading operator of 3-party logistics in Sweden with large regional logistic centers. The firm provides their customers all their logistic needs of import, export, inventory and distribution. Our inventory activities in Helsingborg, Region South have been increasing dramatically with new terminals and more personnel these years. We have been cooperating with Gothia Logistics on various training projects for many years. In 2016 we make great efforts on leadership development at various levels . Our aim is to strengthen competence of our leaders to fulfill their demanding job responsibilities on the greatly changing market of logistics services. 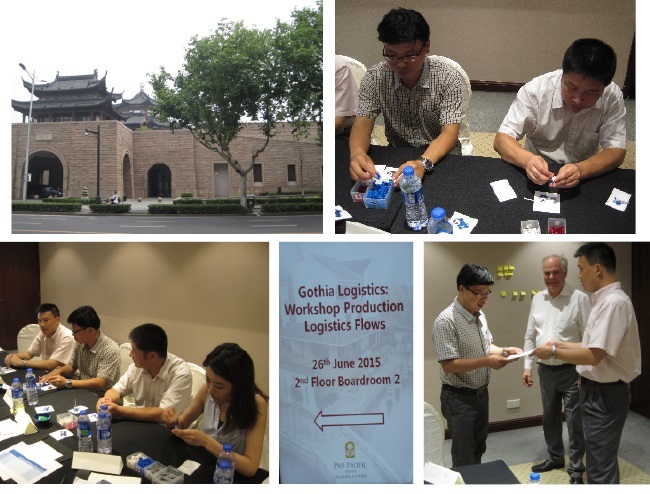 Gothia Logistics has organized and conducted a first workshop on June 26 in Suzhou, China. The theme this time was Production Logistics Flow. The participants came from various Scandinavian companies with manufacturing plants in the surrounding area. This workshop was conducted mainly in Chinese with elements of English. The concept for this workshop includes group exercises, discussion of logistical problems within the participants' businesses and lean game Line, Kanban & Balancing. The exercises are combined with lectures on theories of how the efficiency of logistics flows can be created and followed up with a adapted KPI’s that initiate corrective action. As a follow up to the seminar, the participants, who presented a problem issue for discussion in the group exercises, received a report with suggestions of measures to address the situation. The participants' evaluation confirms that the unique concept suits in China. The number of participants should be kept to small groups so that experiences in discussions between the participants to be exchanged in a constructive way. The logistics manager at AQ comments "professional and fun. The discussion on problem solving is very meaningful." The production manager at Fredriksons thinks that the workshop is "open mind and discussion. Real case analysis. " The long experience that Gothia Logistics has of running professional network in Sweden can be well applied in China. Nearly 100 students at School of Engineering in Jönköping study the course Operational Purchasing – Overview online at the programme of Logistics and Management . The course is included in Purchasing Logistics and is studied merely digitally in English. Next year the new students in Vietnam will take this course as well. The course is developed rapidly together with Jenny Bäckstrand, Ph.D. in order to apply our system for customized education. Gothia Logistics carries out a new training program at school of production at Volvo Car Corporation even this year. The courses are: Basic TPM and Operator Maintenance . The project includes E-learning plus guidance and tests, seminars and practical trainings at the site. The first study group is composed of production leaders from the Swedish factories in Torslanda and Skövde. Production technicians from plants in Europe is going to take part in the next trainings. Gothia Logistics’s market report on China’s E-learning has been referred by Victor Wong, an expert on education and technology, at a webinar held by EU SME Centre in Beijing. Both Victor’s knowledgeable presentation and our report provide EU SMEs valuable information about how to tap into the China’s E-learning market. Volvo Construction Equipment Hallsberg, one of 13 factories and plants in Sweden, participates Volvo Step which is Volvo Group's vocational training in the field of industrial production. One study group in the factory's Volvo Step, will study the course Basic Production Economy and Logistics from Gothia Logistics via the internet with online guide. A great number of personnel at the department of logistics have studied the same course. Gothia Logistics participated at Norrköping's industry trade fair at Stadium Arena during the 8th-9th May. The theme was "We support the work to develop Norrköpings' industry". The participation gave us the chance to meet interesting contacts and gain experience. The winner in our lottery is Peter Berggren from MiROi. He will get a free module course from our education programs. Our CEO, Kjell-Ake Ronnberg was invited by the Governor of Ostergotland Elisabeth Nilsson on a lunch meeting at the Linkoping castle in connection to the visit of the Mr Luo Zhijun Party secretary of the Jiangsu province. This course is approximately 25 hours active study time, depending on previous knowledge. This course is for you, who need a basic introduction to the subject supply chain management.It is suitable when you are working or are about to start working with logistic issues in the company related to the flow of materials. Strategic Purchasing and Operational purchasing. Both courses are Premium Courses and is about 20 hours long. Project China has now started mailing of the questionnaire Company Continued Education for Competence in companies in China. Already during the first week we sent out 40 surveys to unique industrial companies with operations in China. The project is conducted by Yu-Jie Chen and will last 3 months, to start with. Today we would like to welcome Yu-Jie Chen to join us. She is going to help us with further company contact in China under a project. Her presentation of the project is to be published on our website soon and everyone is welcome to take part in it. Last week we made our first workshop in China, at the company AQ Electric in Suzhou. The participants learned by playing a game, made of Lego pieces. Our instructions are translated to Chinese. We got help to translate from English to Chinese from the HR-manager. The Workshop aimed to provide practical training in groups - by playing a game - in how to craft instructions to assemble an excavator of Lego bricks. Now the participants read our course 5S - Sort out and Organize, in our education system, Instant Education. Our CEO, Kjell-Ake has once again traveled to China. This time in company with BENCH - a delegation including the county administrative board of Ostergotland. The delegation includes the county governor, Elisabeth Nilsson and the director of trade and industry in Norrkoping, Anne Revland. Persons from Finland and Latvia representing education and industry are also participating. In particular the Advisory Board will visit the province Jiangsu, the twin town of Ostergotland. Kjell-Ake and his personal at Gothia Logistics wish everyone a Merry Christmas and a Happy New Year! We look forward to an exciting 2012, which for us is a true jubilee year. The office is staffed all working days between weekends. Call or email us if you have questions about courses. Now 80% of the staff at Sapa Heat Transfer Shanghai completed the course 5S, in Chinese. Today all personnel at the factory of Sapa Heat Transfer Shanghai, start reading the course Lean 5S - Sort out and Organize. This week we present further courses in purchasing. More information can be read at our homepage under Premium courses and Module corses. We are now introducing a pair of logistics courses in Chinese. Also the Chinese website is updated! This course will give you an insight into the process of long-term, and in various steps, implement lean production. This will be done in coordination with the organization's values and vision and thus gradually adapt the organization to the new mindset. If you want to know more - feel free to contact us! Have you seen our webpage in Chinese? Follow the link and have a look! Our new course 'Introduction to Business Economics and Budgeting' is now avalable. He has returned with new interesting contacts with universities and companies. Follow this link till our Chinese site! We now translate our first course in Mandarin. We chose our course 5S - Order and method. Our CEO Kjell-Åke Rönnberg is flying to China today for a 10-day trip. There he will meet with customers and prospective customers among Swedish industrial companies that are established in China. Kjell-Åke will visit Beijing, Shanghai and Kunshan. We have now extended our course library with yet another course. The new course is called Basic Lean Production. The course contains basic information about how to a company can prepare before starting an implementation of the tool Lean Production. The course takes you through the world of manufacturing companies, from history and background to how the future can be shaped to lead to success with help from Lean Production. This is a wide course where the participants can develop their knowledge and also lay the foundation for further studies in this sublect. Gothia Logistics has entered a general agreement with Aros Quality Group regarding educational and consultancy services. AQ is one of Sweden's leading suppliers of components and systems for industrial customers with high demands. They deliver to industries in Sweden but also to export markets. AQ group includes about 20 manufacturing units in Sweden, China, Estonia, Bulgaria and Italy. We have once again extended our international course library with a course in 5S. This new course is called 5S - Order and method and is an introductory course to the working method 5S. We have developed two new courses in Supply Chain Management, how to manage coordinated information and material flows, plant operations and logistics. We have today released two new courses: Basic Logistics and Introduction to Inventory Management. Even though we have enjoyed the summer, the sun and the warm weather, we have still managed to create yet another course to our international course library. The course is called Purchasing and Supply and is for you who are working, or are about to start working with purchasing issues, procurement of material, sales etc. The development department has been working hard here at Gothia Logistics and a few days ago we released yet another course in English. This time the subject is distribution and logistics and pertains to the flow from producer to consumer. The course is called Distribution and Logistics and is for you, who work with transports, purchasing, distribution and/or inventories. We've now produced yet another course for the English course library. This time the subject deals with logistics and production economy. The course explains and discusses the connection between economy and logistics and the basic terminology used in daily work situations. We've now added yet another English course to our course library. The course is called Purchasing and Supplier Planning and is intended for people who are working with purchasing issues, procurement of material, sales, project management, designing specifications of requirement or have a cost responsibility regarding maintenance and supplier contacts. The Swedish magazine Perspektiv - ledningssystem och utveckling (nr. 162) has this week mentioned us in one of their articles. The article is about Emba Machinery AB in Örebro, Sweden, the work with Lean Production and the fact that they have used our courses to train their personnel in Lean Production. We have now signed a general agreement with a global multinational company with the purpose to organize an education project for their personnel. The education will deal with the subject Supply Chain Management and will include subjects such as purchase, production and distribution. The course material will be translated into a number of languages depending on the students' whereabouts. We can now offer you education at a fixed cost, no matter how much your staff studies. The courses in this new developed system are short intensive courses (2-5 study hours) and are perfect for studies during unplanned and planned production interruptions. Thanks to this new system, your employees can study whenever they want, as much and as often as they want. The courses are always available online in order to turn non-productive time into effective education. Does this sound like an excellent way to further educate your employees? Please, contact us so that we can discuss your needs and put together a course library that suits your company. In order to improve the contact with our students, and to support our student in the best possible way, we have developed a new student follow-up system. The system detects student that for example have difficulties maintaining a regular study routine, who use a questionable study technique or if someone is in need of extra support in their training. The system also lets us know if a student has done an excellent job in the first part of the course so that we can send him/her a message with some extra praise. Thanks to this system we can coach all of our students, the ones who need extra support but also the ones who manage on their own. Through the system we can support the students either in their course book, by sending them an email or simply by calling them and asking how they are doing. The purpose of the system is to help as many as possible to pass their courses. This proves that studying over the internet does not have to mean that you have to make it on your own. The Swedish magazine Perspektiv - ledningssystem och utveckling (nr. 161) has this week publiced an article about us and our educations. The article discusses our work with Lean Production through e-learning, development work and networks. The Swedish magazine Inköp & Logistik has this week published an article about us and our e-learning courses. The article also brings up our cooperation with Alfa Laval and how personnel from their factories all around the world have studied our e-learning courses. Christmas is approaching and we're closing the office to celebrate Christmas. We'll return on January 2nd. The Swedish newspaper Dagens Industri will this week publish an article about us and our work with Lean Production in their supplement that deals with the subject of Lean Production. The article also brings up the experiences that Metso Minerals in Trelleborg have concerning the cooperation with us and how their factory has drawn profits from educating their personnel in 5S and Lean. Ericsson in Katrineholm, Sweden has just begun studying a customized course in materials flow and warehousing. Thanks to our flexible system, we have developed a unique course, which is composed by different parts of our existing courses in order to suit Ericsson's demand and wishes. We wish our students at Ericsson good luck with their studies. This year Gothia Logistics is celebrating its 15th anniversary. This means that we have now worked with organizational development and education in logistics since 1992 and have over 15 years of experience. During the last 10 years we have also put focus on developing the modern training method e-learning. Nowadays, more and more companies have realized that by using studies over the internet they can make their organization more efficient and at the same time develop their personnel. We have now extended our course library with seven new Subscription courses. The various courses deal with the subjects Production logistics and Warehouse and distribution. This method has been created in order for companies to be able to utilize down time, for example when experiencing production malfunction or other interruptions of operations. These courses comprise 2-3 hours of studying. ITT Flygt in Emmaboda, Sweden has just begun studying a customized course in Lean Production. The course has been adjusted to fit their needs and wishes and includes company-specific information as well as their own material. We wish our students at ITT Flygt good luck with their studies. We welcome our new co-worker Johanna Wieselgren. She will mainly work with developing and maintaining our courses. We welcome our new co-worker Maria Jonsson. She will mainly work with customer contacts and student coaching. We're now changing our name back to Gothia Logistics AB. In connection to this change of name we also give our home page a new look. However, the name Instant education is kept as the name for our education platform. The reason for the change of name is to clarify our work with organizational development and logistics. In connection with the name change, we have also made some changes to our home page. Besides graphical improvements and improvements in content, the big news is that our course library is now generated directly from our database. Thanks to this new function, our courses will always be up to date and include the latest information. In the beginning of this year we started working on a customized variation of the course Production Techniques for Alfa Laval in Lund, Sweden. Alfa Laval wanted the course to contain information and material about the Lean Production philosophy and working with Six Sigma. We have started an extensive education program for Ericsson AB in Sweden. The purpose of the education is to give the company's employees a mutual knowledge about Lean production in an efficient and easy way. In the end of last year we talked to Uponor in Moscow, Russia. They had heard about our education projects with Alfa Laval and wanted a similar education in Inventory Management. Course start was held over the phone and internet in the beginning of 2007. Together with Alfa Laval, we have developed a variation of the course International Purchasing, which will be studied worldwide within Alfa Laval. The course includes customized material from Alfa Laval's organization and fits their needs and wishes. We have yet again expanded our international course library. The newest course is called Physical Supply and Distribution and discusses what happens during the transportation of goods - from the beginning of the process until the end; from subcontractor to end consumer. Our international courses are now part of Alfa Laval's program for further training - Alfa Laval Technical Faculty. Alfa Laval has also decided to use our company-adjusted educational solution called Instant Academy. By using this solution, the courses are integrated in their intranet in order to function as smoothly as possible.